The Ski Race is ON!! I just had a great conversation with Ryan and Roger at Wilderness Lodge and the ski and snowshoe events are on for Sunday, January 21, 2018. Here are a few items to note. The ski course will be closed Saturday night after Wilderness closes. 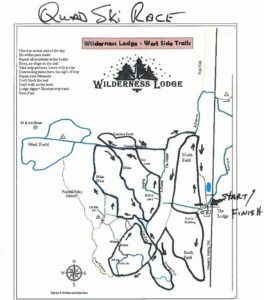 Wilderness will be open to the public on Sunday, but the Quad Ski race course will not open again until 1pm. This will help keep the course in good condition for racers. Please plan your warmup accordingly. Attached you will find a map to both the ski and snowshoe courses. The snowshoe course has changed slightly and will have a section in the woods. Please note that the snowshoe and ski courses do overlap. If you are snowshoeing please be sure to stay to the right of the trail. With our powers combined and a little rule following skiers and snowshoers can can live in harmony. 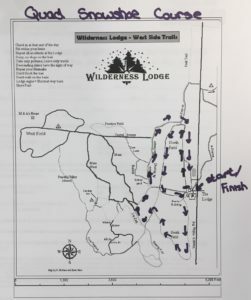 We are expecting a freeze Saturday night and the Wilderness team will be out covering any thin spots, but the course is subject to change slightly due to trail conditions.